A free Helpline giving expert information and support and staffed by specialist breast care nurses. Our Ask Our Nurses service for people who find it easier to ask their question by email – each question receives a personal response from one of our breast care nurses. A website providing up-to-date and reliable clinical and practical information about all aspects of breast cancer and breast health. A busy online Forum, which provides a safe place for people to support each other – at any time of the day or night. Free publications covering a wide range of issues, from coping with a breast cancer diagnosis to health and well-being. Someone Like Me connects people affected by breast cancer, by phone or email, to others who’ve had a similar experience and are specially trained to help. Live Chat sessions which allow people with secondary breast cancer to talk to and support each other. A Nursing Network for breast care nurses and other specialist healthcare professionals, helping them to share best practice and keep their skills up-to-date. Visit www.breastcancercare.org.uk or call our free Helpline on 0808 800 6000. Registered charity: England and Wales 1017658, Scotland SC038104. 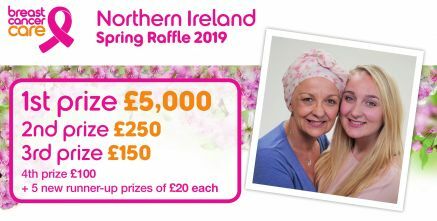 Breast Cancer Care’s Northern Ireland Raffle is registered with Belfast City Council, registration number 238. Responsible person; Catherine McCrohan, Breast Cancer Care, Kennington Business Park, Chester House, 1-3 Brixton Road, London, SW9 6DE.